A force has begun training its firearms officers to use the latest Taser model. 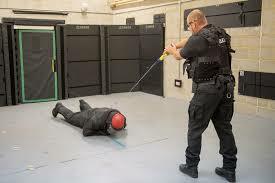 Staffordshire Police has invested £128,000 to supply each officer from the 90-strong unit with the Taser X2. Research conducted by the Home Office recently revealed every firearm officer who trialled the more advanced model felt it outperformed its predecessors, the X26 or X26e. The Taser X2, costing £1422 per device, boasts a multitude of improved functions, including automatically being able to switch on the user’s body-worn camera as soon as the safety mechanism is turned off. It also provides greater accuracy and features a second cartridge for swift back-up if the first shot misses or disconnects. The X2 has a switch, which can quickly initiate a warning arc without deploying any cartridges - unlike the outdated model - to act as a deterrent. Staffordshire Police Inspector Chris Dawson, Head of Armed Response and Firearms Training, said: “The new equipment will make a huge difference in helping to calm potentially violent situations where other tactics have been considered or failed. The Home Office gave the latest model green light in March last year, however, almost half of forces have not yet introduced X2.